Mikkelsen WP. Intestinal angina: its surgical significance. Am J Surg. 1957 Aug;94(2):262-7. 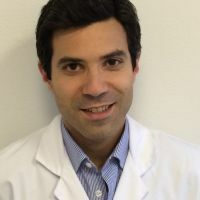 Björck M, Koelemay M, Acosta S, Bastos Goncalves F, Kölbel T, Kolkman JJ, Lees T, Lefevre JH, Menyhei G, Oderich G, Esvs Guidelines Committee, Kolh P, de Borst GJ, Chakfe N, Debus S, Hinchliffe R, Kakkos S, Koncar I, Sanddal Lindholt J, Vega de Ceniga M, Vermassen F, Verzini F, Document Reviewers, Geelkerken B, Gloviczki P, Huber T, Naylor R. Editor’s Choice – Management of the Diseases of Mesenteric Arteries and Veins: Clinical Practice Guidelines of the European Society of Vascular Surgery (ESVS). Eur J Vasc Endovasc Surg. 2017 Apr;53(4):460-510. doi: 10.1016/j.ejvs.2017.01.010. Do you think that isolated SMA occlusion can cause mesenteric ischemia? Although the Mikkelsen rule is that at least two of the three intestinal vessels (celiac artery [CT], superior mesenteric artery [SMA] and inferior mesenteric artery [IMA]) need to be severely stenosed/occluded to cause mesenteric ischemia , the truth can be different in the daily practice. Chronic mesenteric ischemia can be caused can an isolated SMA occlusion, especially if the collateral network is weak (prior abdominal/colic surgery) or if the disease extends to the distal SMA. Acute mesenteric ischemia can of course be caused by an isolated SMA occlusion. Which would be your primary SMA revascularization method? It is hard to give a clear answer based on one single CT view. However, endovascular therapy seems here feasible since there is a short stump of patent SMA. Also, the lesion is not calcified at all. 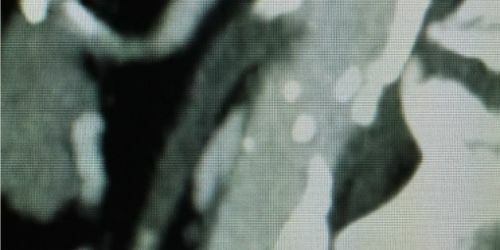 In contrast, open surgery might be challenging since the supraceliac and the infrarenal aorta are heavily calcified – probably so are the iliacs – which complicates clamping. 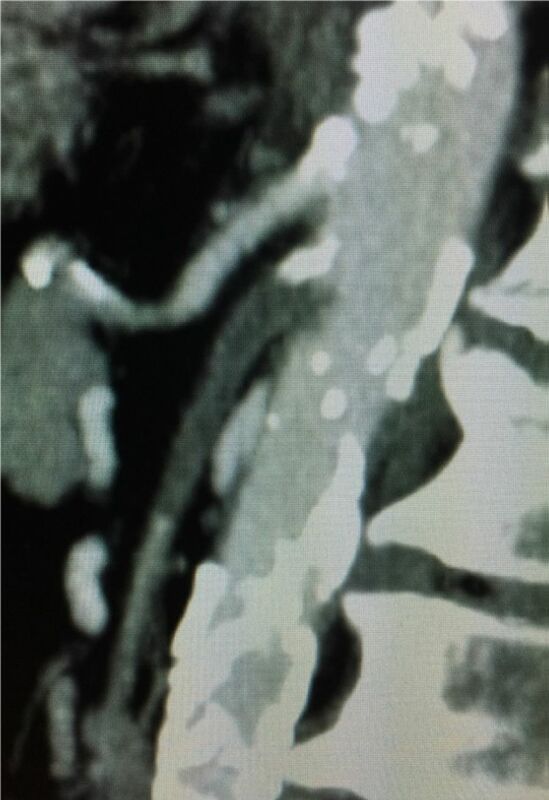 SMA transposition in the infrarenal aorta should be kept in mind but with the same clamping issues. However, we recently communicated on a surgical technique of clampless aortic anastomosis in such cases (see the case in the polling station). If there is need to open the abdomen (symptoms/blood tests with suspicion of acute mesenteric ischemia onset), retrograde open mesenteric stenting (ROMS) would be then my preferred option . When I finished my residency, I was sure that the upper extremity was the easiest solution to access the intestinal vessels. Nevertheless, risks associated with arch navigation (stroke) are real in these patients with a generally multilevel atherosclerotic disease. The common femoral access generally allows to catheterize most SMA lesions, even in case of SMA occlusion. It is paramount to use specific material (45/55 cm pre-curved sheath and VS1 catheter on the table). In case of very acute SMA-to-aorta angle (as for the present case), directional steerable sheaths/catheter can be of great help. Which is your primary endovascular treatment option? 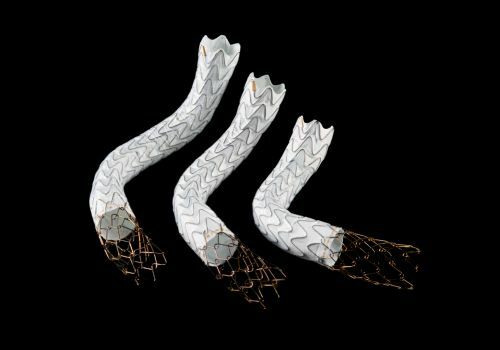 I generally use balloon-expandable covered stents in the SMA. It allows a very precise placement to avoid covering collaterals and protects from emboli secondary to the angioplasty. When the disease extends more distally, I then add a self-explandable uncovered bare metal stent to avoid mesenteric kinking. This would be necessary in this case. I never use balloon angioplasty without stenting and this is in accordance with recent ESVS guidelines . These guidelines represent an important document that vascular surgeons should read and know. Which conduit do you prefer for surgical reconstructions? Synthetic conduits avoid bypass kinking, especially when you perform a retrograde bypass from the infrarenal aorta or the iliacs. I generally use grafts reinforced with external rings. It is paramount to cover the graft with the omentum at the end of the procedure. There are 2 exceptions: septic context (bowel necrosis) and small diameter (<4mm) of the outflow vessel. A conduit not proposed here but that can be of interest (if the saphenous vein is not available) is the autologous SFA. In case of severe calcification of the aorta which surgical revasculariation option do you favor? Retrograde open mesenteric stenting (ROMS) is a great, fast and simple technique that avoids any clamping with high technical success rates and promising results . The technique of clampless anastomosis we recently communicated on (see polling station) is also an option is such cases.